How would you like to WIN the soon to be released Madagascar 3? I know my kids can't wait for this to be released so we can get! This would make one awesome Christmas gift!! So you will want to HURRY and ENTER!! 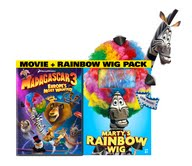 They will be selecting a FEW WINNERS to receive the Madagascar 3 DVD and wig combo! !